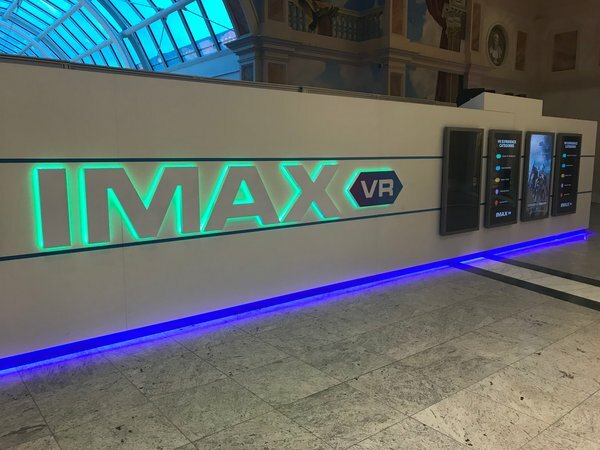 IMAX Corporation (NYSE:IMAX) and ODEON Cinemas Group today unveiled the new IMAX VR Experience Centre in the ODEON cinema at intu Trafford Centre in Manchester. The IMAX VR Centre is the first to be installed in Europe and the fifth IMAX has launched worldwide, delivering immersive, multi-dimensional virtual reality experiences, including movie entertainment content and games. IMAX VR at ODEON is a mind-shattering Virtual Reality (VR) experience in a location-based, state-of-the-art experience centre. The IMAX VR experience features a unique combination of premium technology and world-class content that lets users see, feel, move and play in new worlds in a powerfully immersive and realistic way, much like IMAX® cinemas offer cinemagoers a differentiated and best-in-class film experience. With groundbreaking VR headset technology, 360-degree sound and sophisticated room tracking, players will be instantly transported into new interactive virtual worlds that are more realistic than anything imaginable. The Centre, which is located in the lobby of the ODEON at intu Trafford Centre, employs a new design – proprietary to IMAX – that consists of ten “pods” to allow multiple players to enjoy highly interactive, exciting, moveable VR experiences in an extremely social environment. The pods, which are designed to optimise user mobility and interaction in virtual environments, can be adapted for specific content experiences – whether single or multi-user. With its multiplex pilot locations, IMAX is testing VR’s ability to draw younger audiences, particularly millennials and Gen Z, to the cinema in greater numbers. IMAX will provide the Experience Centre with an ongoing array of new, premium interactive content experiences that are each expected to range between 8 and 15 minutes in length. Content experiences featured at the ODEON at intu Trafford Centre include IMAX VR exclusive runs of Ubisoft’s Star Trek™: Bridge Crew Rescue at Perseph and the newly launched Justice League: An IMAX VR® Exclusive from Warner Bros. Through its recently established IMAX VR Content Fund, the Company is in advanced stages with several content developers, including Hollywood studios and gaming publishers, to create high-quality VR experiences for exclusive runs in IMAX Centres. IMAX recently announced a new co-financing and production agreement with Warner Bros. Home Entertainment to develop and release three premium, interactive VR experiences based on some of Warner Bros. Pictures' most highly anticipated upcoming blockbuster films. Justice League: An IMAX VR Exclusive marks the first release under the agreement. IMAX has launched pilot IMAX VR experience Centres in Los Angeles, New York City, Toronto and Shanghai and is expected to open up to five additional experience Centres in the U.S., Asia and elsewhere in the coming months. IMAX plans to use these pilot locations to test several elements, including the overall customer experience, pricing models and the types of content featured. If successful, the intent is to roll out the concept globally to select multiplexes as well as commercial locations such as shopping centers and tourist destinations.